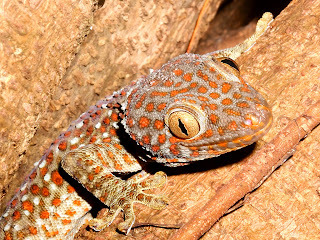 Geckos are lizards belonging to the infraorder Gekkota, found in warm climates throughout the world. They range from 1.6 cm to 60 cm. Most Geckos cannot blink. They have a fixed lens within each iris that enlarges in darkness. Geckos use their long tongues to clean their eyes and keep them dust-free. All geckos, excluding the Eublepharidae family, lack eyelids and instead have a transparent membrane, which they lick to clean. Above is a documentary of facts about the Gecko Lizard. Also things about what they do for a living and also so amazing how they climb up the wall and stick and don't fall up. They are upside down. Watch and see the facts and you will be surprised.